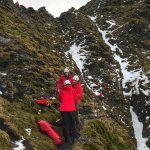 A 45 year old female had walked up Walla Crag before becoming disorientated in the heavy snow. She was distressed and was not confident to continue. She was contacted by the team on her mobile phone but it was still unclear where she was. A team member walked over the summit of Walla from Keswick and started down Cat Gill where he met up with the lady and walked her back over Walla to Rakefoot Farm then drove her to her car.